There are two music videos for the Turnstiles album, performances of "Say Goodbye to Hollywood" and "James," which may have been from a television program. © 1976 Sony Music Entertainment. "Say Goodbye To Hollywood" is Billy Joel's goodbye to the Los Angeles music scene and to the first phase of his solo career as an LA-based singer-songwriter. It has some of the best lyrics Billy has ever penned ​but for some reason this songs is rarely hailed as one of Billy's finest. 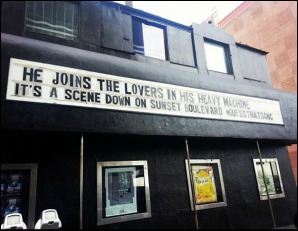 The song marked Billy's decision to leave Los Angeles and return to his home state of New York. He needed to move back in order to sort out his career and life again. He said: “I was really happy to be getting out of L.A. The first year I was there, I was kind of seduced by the nice weather, the palm trees and the views from the Hollywood Hills, the Pacific Coast Highway and all that stuff. That wore off after about a year.” See Rolling Stone. 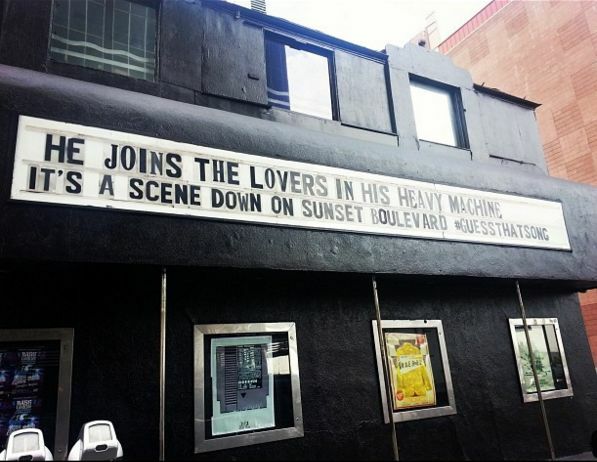 From the Roxy in 2012. Click on photo to enlarge. Some have gone and some remain, All these places have their moments, With lovers and friends I still can recall, Some are dead and some are living, In my life I've loved them all." The line in "Say Goodbye to Hollywood" about Johnny "not being his "fast gun" anymore and his style being so right for "troubadors" (i.e., like Billy) is a reference to Billy's then-manager/promoter, Jon Troy, who loved the music but perhaps was not the right person to be a business manager. Troy was eventually replaced by Billy's wife Elizabeth as Billy's manager. This is similar to a Bruce Springsteen motif, like Spanish Johnny from "Incident on 57th Street" from the 1973 album The Wild, the Innocent & the E Street Shuffle. "Say Goodbye to Hollywood" is also a tribute to Ronnie Spector and the Ronettes and their hit song "Be My Baby." It features a Phil Spector-like "wall of sound" and Ronnie even did a cover version of the song in 1978.with the backing of Bruce Springsteen's E Street Band (to see a brief live version, click here). See the Rolling Stone article about Ronnie's cover. Ronnie had a minor hit with the song, which features a great sax solo by Clarence Clemons. It's not quite a scene down on Sunset Boulevard, but here is Billy and the band. 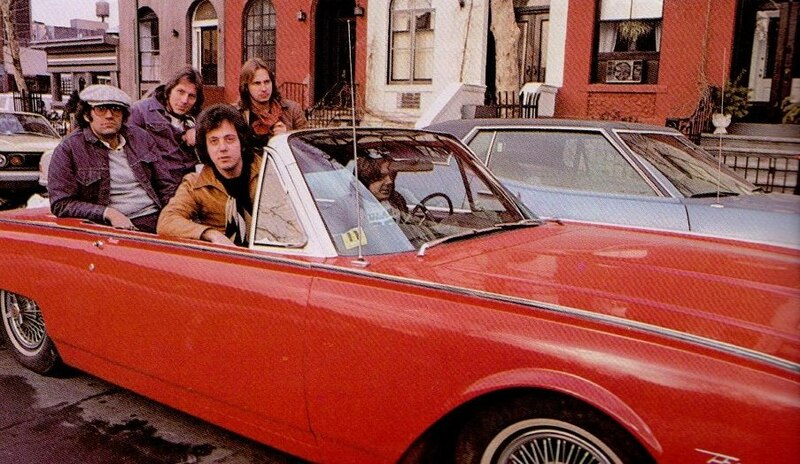 The songbook for Turnstiles featured photos of Billy in an urban setting such as this one with band members (Brian Ruggles is driving). Photo: Unknown. Click on photo to enlarge. Listen to Billy discuss The Ronnettes' "Be My Baby" and his homage, "Say Goodbye to Hollywood" on SiriuxXM. Bette Midler also recorded a version of the song on her 1977 album Broken Blossom. A live version by Billy was released as a single in 1981 from his Songs In The Attic album and was a moderate hit (see video below, right). The song could have fit in well on Billy's 1983 album, An Innocent Man, which was a tribute to the songs of the 1950s and 1960s. ​ Billy does not sing "Say Goodbye to Hollywood" that often in concert anymore (he has said that it "shreds" his vocal cords), and it is not on any of his live albums or concert videos since 1981's Songs In The Attic. It is a shame because "Say Goodbye to Hollywood" is one of Billy's most interesting songs and contains some of his best lyrics. ​ Below (left) is a live version from 1978 during his tour in Europe. The band (Russell Javors, Richie Cannata, Liberty DeVitto, and Doug Stegmeyer) does an excellent job on this version. And further below (right) is a more recent version. A live version from Billy's televised concert in Germany (1978). In this Master Class from 2001, Billy explains how he was inspired to write "Say Goodbye To Hollywood" from the Ronettes' "Be My Baby." Unplugged version by Billy Joel at the Roxy in 2012. This is the music video for the 1981 live version, released on Songs In The Attic. Live version of "Be My Baby" by the Ronettes, a classic song. Live performance from February 18, 2015 at Madison Square Garden.